2010 Peanuts Photo Contest: Celebrities Love Peanuts, Too. A year long tribute celebrating sixty years of Peanut has been held across the globe in 2010. The tribute culminates on October 2, the "birth date" of the beloved world of PEANUTS. To celebrate sixty years of Peanuts, the first-ever Peanuts Look-Alike contest was held. This was the contest's website. The content below is from the site's archived pages, as well as from other outside sources. I liked the fact that this first-ever PEANUTS 60th Anniversary Photo Look-A-Like Contest, would benefit the Boys & Girls Clubs of America. Peanuts fans of all ages were invited to submit photos of themselves or their children looking like one of these Peanuts characters: Charlie Brown, Snoopy, Lucy, Linus, Sally, Schroeder, Franklin, Peppermint Patty, Marcie or Pigpen, or one of Snoopy’s classic alter-egos, Joe Cool or the World War I Flying Ace. Submissions were accepted through November 3, 2010. The finalists, selected by a panel of celebrity judges, were posted on November 11 after which the public was able to vote for their favorite finalist through November 30. The winners were announced in December. With philosophical humor, subtle social commentary, quotable wisdom and irresistible charm, “Peanuts” grew to become not just the best-known, most-loved comic strip ever created, but a true global phenomenon. I loved reading Peanuts as a youngster and my kids have watched Peanuts classic television specials, read Peanuts books, and have licensed Peanuts t-shirt, Snoopy stuffed animals and even tooth brushes with Peanuts characters. The celebrity judges included Jill Schulz, daughter of Peanuts creator Charles M. Schulz; country music legends Garth Brooks and Trisha Yearwood; “Supernanny” Jo Frost; “America’s Next Top Model” judge and fashion photographer Nigel Barker; and Victoria Reca~no, co-anchor of KTLA 5 News at 6 and KTLA 5 News at 10. I had just returned from a conference about setting up an online business selling wholesale vapor supplies by RichMountainDist.com, when my kids showed me this site and said they wanted to enter the contest. My head was still spinning with information about vaping atomizers, mods, starter kits, e-liquids and all the accessories associated with vaping. I was trying to organize in my head our priorities regarding which brands to carry when my thought process was interrupted with the incessant pleas of "Daddy, come look at this!!" Well, the Peanuts Look-Alike contest sounded fund, so we all sat down to plan our look-a-like submissions.We didn't win, but we had lots of fun. The Peanuts folks have come up with a series of celebrity look-a-likes to give people a bit of inspiration before they start snapping their own look-a-like photographs. Which are our favorites? We're not telling. Is Peanuts the Comic Strip to the Stars? Perhaps, since celebrities love Peanuts, too. And some famous folk even bear an amazing resemblance—whether looks-wise, personality-wise or otherwise!—to their comic-strip counterparts. Take a look! THE SMART LOOK(-A-LIKE): Who's got brains, a pointed sense of humor, and looks great in glasses? Why that would be Marcie, best pal to Peppermint Patty, and Emmy-winning sensation Tina Fey! If Marcie were looking for a job today, we all felt that she would be into the technology field, perhaps as a coder with a specialty in customizing Salesforce software. Salesforce is a cloud computing and social enterprise software-as-a-service. The company that has created Salesforce is best known for its Salesforce customer relationship management (CRM) product. Businesses and organizations have flocked to this platform. One of the main advantages of Salesforce is its flexibility with respect to customization. Hello, Marcie. This is your niche. Just image Marcie explaining what her role is on a team of Saleforce techies: "Ahem. Customizing a company or an organization's Salesforce org involves coding new modules, either business logic, front-end components, or both, using the Salesforce programming language, APEX, as well as the front end framework, VisualForce." Or perhaps she wants to explain the difference between the Salesforce's two major components: Configuration and Customization. " The user interface for the Salesforce CRM application configuration enables businesses and organizations to modify objects, fields, validation rules, workflow, security settings, formulas, etc. with more configurable features available with some of the higher editions of Salesforce." Get it? Well, if not, Marcie would. And that's why we love Marcie. THAT'S OUR GIRL! Opinionated, outspoken, occasionally outrageous—yes, that's Lucy van Pelt. But the description also fits Debi Mazar (Entourage, Dancing With the Stars) to a T. Or an L. And since she's married to musician Gabriele Corcos, she clearly got her Schroeder. 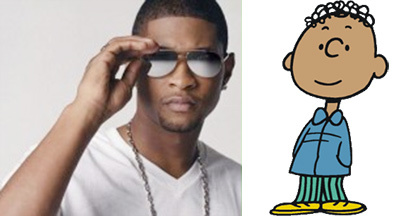 PUTTING THE GENTLE IN GENTLEMAN: With a kind word for everyone, even hapless hero Charlie Brown, Franklin is a special guy—matched in style and grace only by his real-life look-a-like, Usher. HIGH-FLYING HEROES: Only one man fits the bill as the human counterpart to Snoopy's daring alter-ego, the World War I Flying Ace. That would be heroic US Airways pilot Chesley B. Sullenberger III, who, along with his crew, landed US Airways Flight 1549 in New York's Hudson River after their aircraft lost its engine thrust, saving the lives all 155 people aboard. Talk about flying in style! A PEPPERMINT PATTY DOUBLE PLAY: Gold-medal-winning Olympic gymnast (and Dancing With the Stars champion) Shawn Johnson and Peppermint Patty share a number of admirable qualities: fearlessness on the field of play, a down-to-earth approach to life, and a fun and funny attitude that makes them beloved of everyone who knows them. SWEET BABBOO TOO: Linus and Michael Cera have plenty in common-they both project an innocent philosophical wisdom that girls go crazy for. Just as Sally Brown pines for Linus, her "sweet babboo," we saw Cera's charms as Paulie Bleeker work their magic on a certain girl named Juno. FLUSTERED CHARM: Bemused, befuddled or bewildered, the sweetly comic Simon Pegg (Star Trek, Shaun of the Dead) has Good OI' Charlie Brown written all over him. PERKABILITY PLUS: The acclaimed singer-actress won a Tony for her role as Sally in You're a Good Man, Charlie Brown, so there's always been a special bond between the two blondes—not to mention certain similarities in height (or, ahem, the lack thereof) and a charming self-confidence that wins the day, every day. HEAD IN THE CLOUDS—OF DUST: As a guy who's completely at home surrounded by dirt, Mike Rowe (Dirty Jobs) is the real-world counterparts to Peanuts' beloved Pigpen. That's one thing that's crystal-clear. THE CUTTING EDGE OF COOL: In the 1970s, the world was introduced to a new kind of cool—Joe Cool. In the 21st century, actor-filmmaker Seth Green creates his own cool style. A little less beagle, a little more...Robot Chicken. HEARTTHROB AT THE KEYBOARD: Any guy who can turn loud-mouthed Lucy into a pile of mush has to have an extraordinary gift. Schroeder does—and so does Harry Connick, Jr. Not just a pretty face, he really knows his way around the piano. Even Beethoven would approve! TWO PEAS IN A POD: Separated at birth? Note the uncanny resemblance between Whoopi Goldberg and Woodstock—the distinctive hairstyle, the flashing dark eyes, the um, chirpy personality? Well, the two W's do have one thing in common: an international audience of devoted fans.